One of the most re-told stories of Christmas is the classic novel by Charles Dickens, A Christmas Carol. I have seen so many different versions from films staying true to the classic story to twisting just about everything they could without destroying the overall story. From live-action to cartoon, CGI, and Claymation, it is clearly a timeless tale that I’m sure will be told a hundred more times in Christmases yet to come. The Muppet Christmas Carol is a flick that I know at one point I had the pleasure of watching, but they all blend together…it’s hard to really remember this as loud and impressive as some of the others. Still though, if you’re a kid, this is one of the few Christmas Carol films that you can really enjoy. As you know, this is one of the most iconic and memorable plots of all time – Ebenezer Scrooge (Michael Caine) is probably the grumpiest man on the planet around Christmas time. Okay, all the time. However, on Christmas Eve, his grumpiness is the focus of the spirit world. Apparently, all spirits want him to turn over a new leaf, so they send Christmas Past, Present, and Future to his house as a reminder of who he was in relation to who he is now, and how his life will affect people in the future. The only difference between this film and other films like it…are the Muppets…which respectfully is a huge difference. When I think of this story, my mind believes that it is one of the best Christmas stories of all time, because it blends a lot of messages that are incredibly important together in a film that starts out dark, lightens up for a little bit, then gets really dark near the end, and finally finishes off really light-toned and refreshed. The problem this film faces is that…well…it’s the Muppets, and the dark tones that the film ultimately needed is really watered down with cartoonish Muppet jokes. There are some dark tones in here, given, but the true story should either give kids nightmares, or darn near it. It’s one of the truest depictions of redemption I’ve ever seen. In order to save someone from the darkness, you have to first travel there to get them…which really doesn’t happen here. Sure sure, this is a kids film…which I have to take into account. Kids can’t ever enjoy the story because it truly is a dark tale that is nightmare-inducing. That’s not bad, it’s just not convenient for families, so you get these kid-friendly versions of classic stories, much like Mickey’s Christmas Carol. There are things about the film that kids can truly appreciate and enjoy, but adults might just find themselves preferring a more accurate film. You can’t make a story like this a comedy…unless it is a dark comedy. Jim Carrey’s version isn’t terrible because it stays true to the original story, but Jim Carrey’s personality and the dark comedy keep it enjoyable. This film is purely light comedy…and even though I don’t consider that a disaster for the story, I don’t prefer it. Also, this is Muppets, so it’s a musical. Like most of their musical films, it’s got maybe one or two memorable songs, but the rest are…meh. That’s okay though, because the film isn’t exactly littered with singing, it just shows up here and there. Also, Michael Caine wasn’t the best Scrooge, sorry to say. Maybe that has something to do with not wanting young children to cry, but his emotional scenes with his old girlfriend and Tiny Tim are laughable at best. For kids, this is one of the better versions of the classic tale by Charles Dickens. It’s not as dark as the other versions, so young kids won’t have to worry about getting nightmares. Also, for what it was, the Muppets are still funny on a certain level, and this is the first time Steve Whitmire took over for the role of Kermit, to which he is still in the role today. A Christmas Carol isn’t just an iconic story, it’s important when talking about a “Grinch” or a “Scrooge”, which exist in real life…the story needs to understand that in order to save someone from darkness, you must travel into the dark to get them. That means the film really needs to feel dark. That is a really important tone for any Christmas Carol film, and this film didn’t have that. 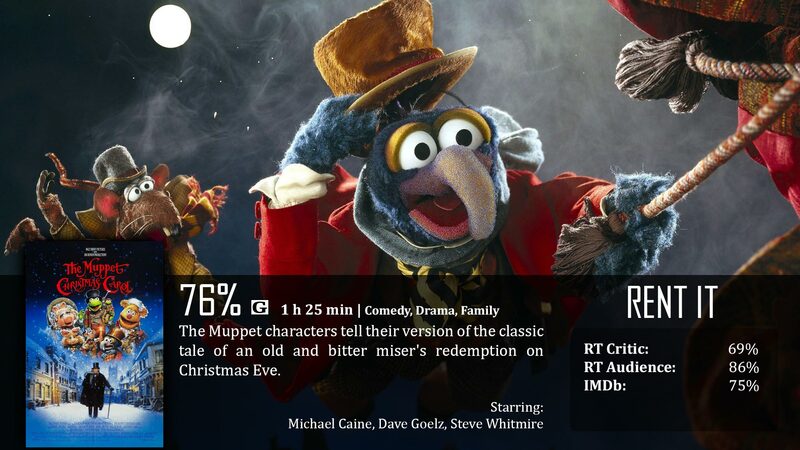 In short…the Muppets ultimately screwed it up. Ebenezer Scrooge: What right have you to be merry? You’re poor enough. Fred: What right have you to be dismal? You’re rich enough.